This tutorial is the third in a series of a Visual Basic versions of the Introduction to ASP.NET MVC 5 tutorials published on the www.asp.net site. The original series, produced by Scott Guthrie (twitter @scottgu ), Scott Hanselman (twitter: @shanselman ), and Rick Anderson ( @RickAndMSFT ) was written using the C# language. My versions keep as close to the originals as possible, changing only the coding language. The narrative text is largely unchanged from the original and is used with permission from Microsoft. You'll create a view template file using the Razor view engine. 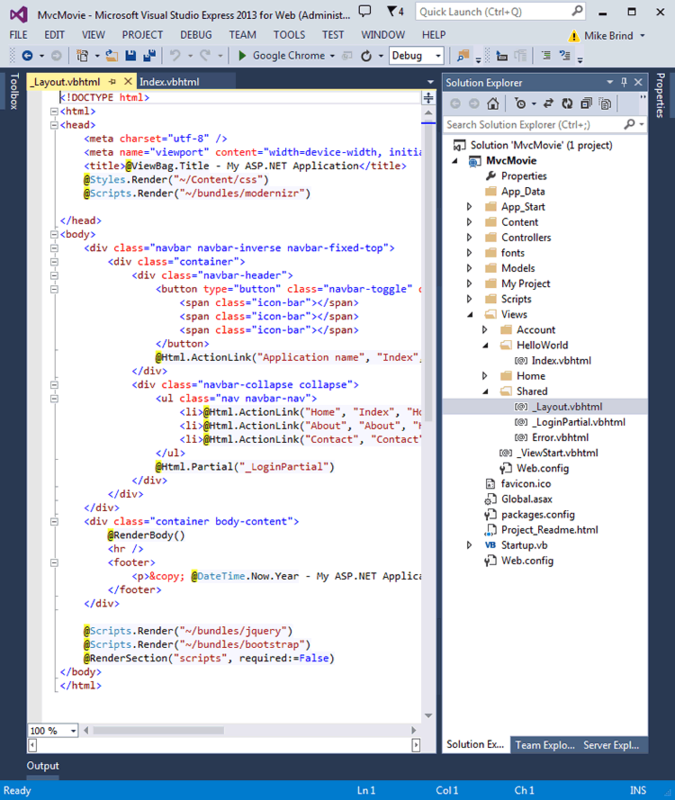 Razor-based view templates have a .vbhtml file extension, and provide an elegant way to create HTML output using Visual Basic. Razor minimizes the number of characters and keystrokes required when writing a view template, and enables a fast, fluid coding workflow. 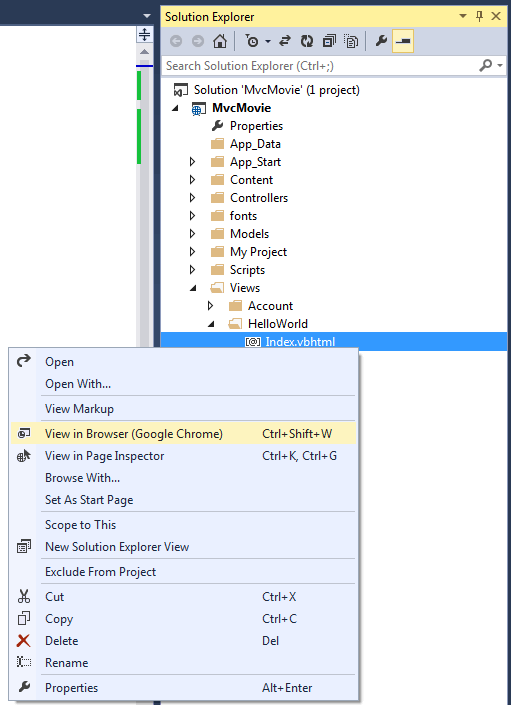 Right click the Views\HelloWorld folder and click Add, then click MVC 5 View Page with (Layout Razor). In the Select a Layout Page dialog, accept the default _Layout.vbhtml and click OK. In the dialog above, the Views\Shared folder is selected in the left pane. If you had a custom layout file in another folder, you could select it. We'll talk about the layout file later in the tutorial. In the meantime, the MvcMovie\Views\HelloWorld\Index.vbhtml file is created. Right click the Index.vbhtml file and select View in Browser. You can also right click the Index.vbhtml file and select View in Page Inspector. See the Page Inspector tutorial for more information. 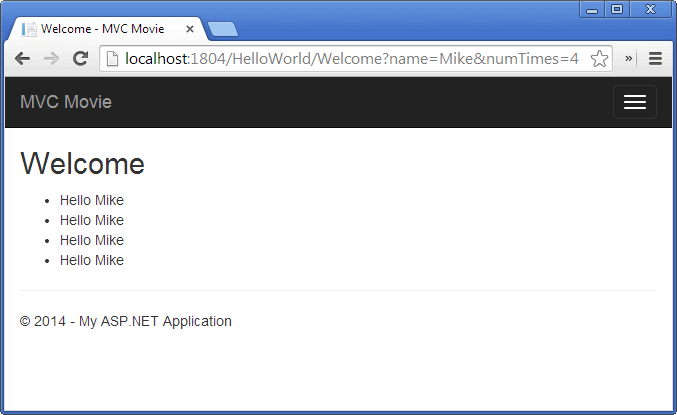 Alternatively, run the application and browse to the HelloWorld controller (http://localhost:xxxx/HelloWorld). TheIndex method in your controller didn't do much work; it simply ran the statement Return View(), which specified that the method should use a view template file to render a response to the browser. Because you didn't explicitly specify the name of the view template file to use, ASP.NET MVC defaulted to using the Index.vbhtml view file in the\Views\HelloWorld folder. The image below shows the string "Hello from our View Template!" hard-coded in the view. Looks pretty good. 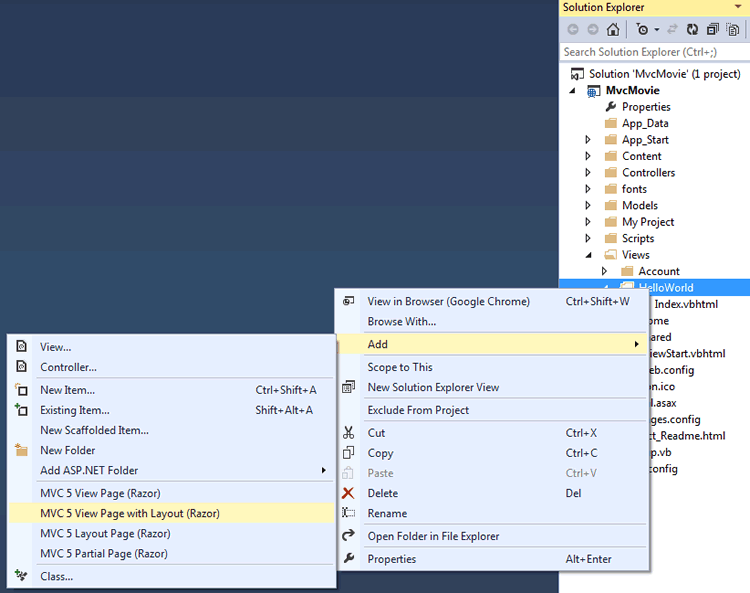 However, notice that the browser's title bar shows "Index My ASP.NET Appli" and the big link on the top of the page says "Application name." Depending on how small you make your browser window, you might need to click the three bars in the upper right to see the to the Home, About, Contact, Register and Log in links. First, you want to change the "Application name" link at the top of the page. That text is common to every page. It's actually implemented in only one place in the project, even though it appears on every page in the application. 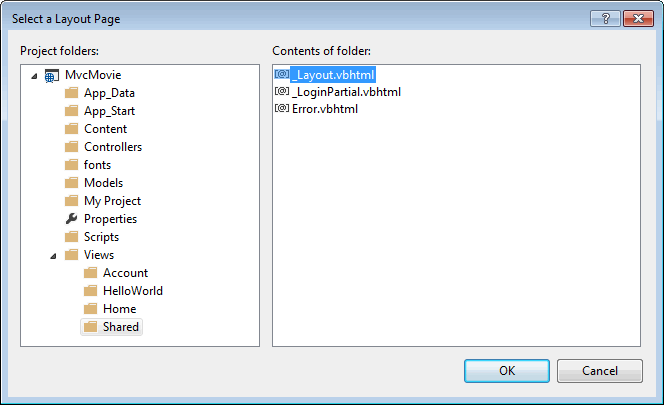 Go to the /Views/Shared folder in Solution Explorer and open the _Layout.vbhtml file. This file is called a layout page and it's in the shared folder that all other pages use. Layout templates allow you to specify the HTML container layout of your site in one place and then apply it across multiple pages in your site. Find the @RenderBody() line. RenderBody is a placeholder where all the view-specific pages you create show up, "wrapped" in the layout page. For example, if you select the About link, theViews\Home\About.vbhtml view is rendered inside the RenderBody method. The Razor code above explictly sets the layout page. Examine the Views\_ViewStart.vbhtml file; it contains the exact same Razor markup. The Views\_ViewStart.vbhtml file defines the common layout that all views will use Therefore you can comment out or remove that code from the the individual view files such as Views\HelloWorld\Index.vbhtml. You can use the Layout property to set a different layout view, or set it to Nothing so no layout file will be used. 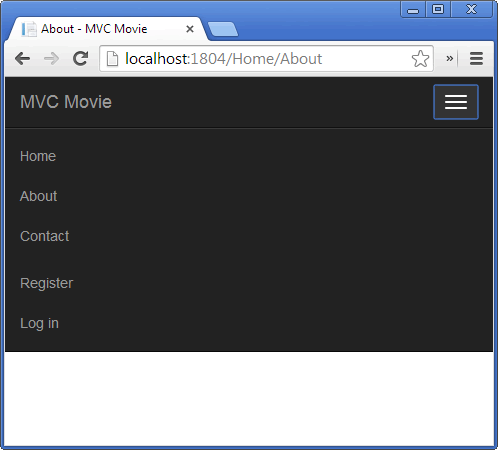 Open MvcMovie\Views\HelloWorld\Index.vbhtml. There are two places to make a change: first, the text that appears in the title of the browser, and then in the secondary header (the <h2> element). You'll make them slightly different so you can see which bit of code affects which part of the app. To indicate the HTML title to display, the code above sets a Title property of the ViewBag object (which is in the Index.vbhtml view template). Notice that the layout template (Views\Shared\_Layout.vbhtml ) uses this value in the<title> element as part of the <head> section of the HTML that we modified previously. Run the application. Notice that the browser title, the primary heading, and the secondary headings have changed. (If you don't see changes in the browser, you might be viewing cached content. Press Ctrl+F5 in your browser to force the response from the server to be loaded.) The browser title is created from the ViewBag.Title we set in the Index.vbhtml view template and the additional "- MVC Movie" added in the layout file. Also notice how the content in the Index.vbhtml view template was merged with the _Layout.vbhtml view template and a single HTML response was sent to the browser. Layout templates make it really easy to make changes that apply across all of the pages in your application. Currently, the Welcome action method in the HelloWorldController class takes a name and a numTimes parameter and then outputs the values directly to the browser. Rather than have the controller render this response as a string, let’s change the controller to use a view template instead. The view template will generate a dynamic response, which means that you need to pass appropriate bits of data from the controller to the view in order to generate the response. You can do this by having the controller put the dynamic data (parameters) that the view template needs in a ViewBag object that the view template can then access. Now the ViewBag object contains data that will be passed to the view automatically. 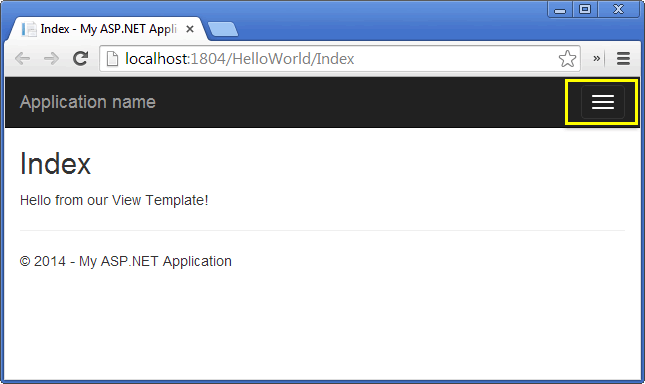 Next, you need a Welcome view template! In the Build menu, select Build Solution (or Ctrl+Shift+B) to make sure the project is compiled. 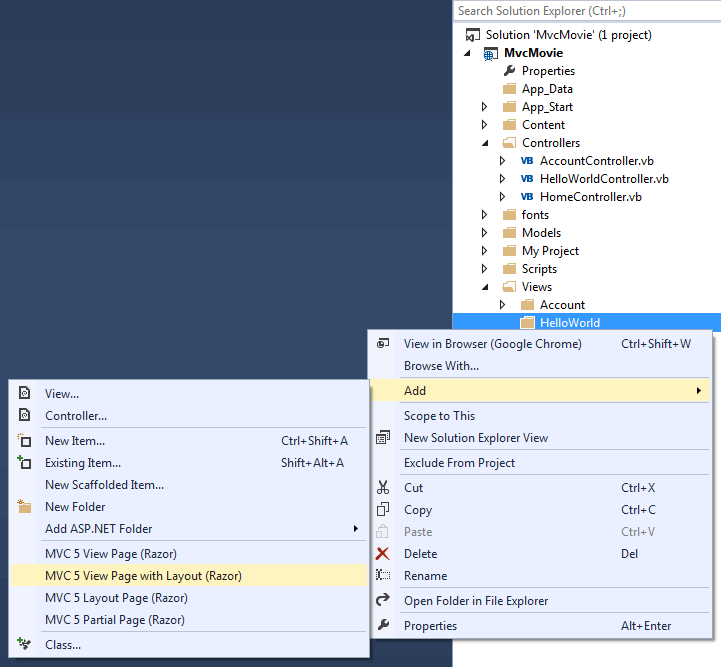 Right click the Views\HelloWorld folder and click Add, then click MVC 5 View Page with (Layout Razor). 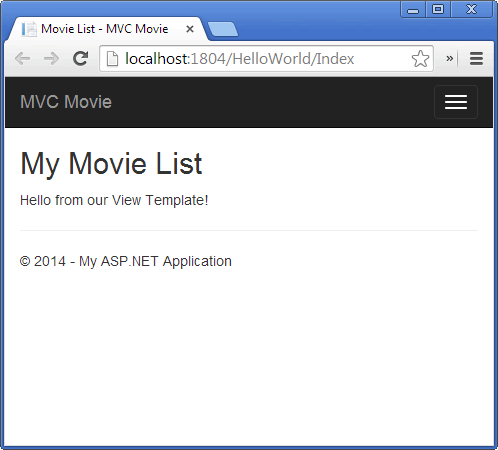 The MvcMovie\Views\HelloWorld\Welcome.vbhtml file is created. Replace the markup in the Welcome.vbhtml file. You'll create a loop that says "Hello" as many times as the user says it should. The complete Welcome.vbhtml file is shown below. In the sample above, we used a ViewBag object to pass data from the controller to a view. Later in the tutorial series, we will use a View Model to pass data from a controller to a view. The view model approach to passing data is generally much preferred over the view bag approach because it allows you to work with strongly typed data. See the blog entry View Model Design And Use In Razor Views for more information. Well, that was a kind of an "M" for model, but not the database kind. In the next section, you will begin to work with structured data and create a database of movies.